What does this tell me? | carpe diem! 1. They were right. For about a year Stuart (who cuts my hair) and my husband have told me I look better with slightly longer hair, so I tried it. Since May I’ve had hair long enough to touch the tops of my ears, long enough at the back to be inside my high-neck sweaters, long enough on top that it felt hot under there. It looked good, I have to admit it. People actually paid me compliments. Yesterday I demanded that Stuart (poor chap) cut it the way I like it. Really short, shorter than my husband’s, clippered up the back, so short on the sides that my ears stick out. It feels wonderful and it looks… well, now I know what I could look like. I cropped my head from the picture to spare myself the embarrassment. Last time I felt this way about a haircut I wore a scarf or two wrapped around my head for about a fortnight. Poor Stuart. He didn’t want to do it. You can’t really see from here, but the raglan seams are indeed running in the general direction of my armpits; the angle of approach changes as I change the drape of the thing. I have a feeling that the ‘real’ angle is a bit shallow, so the sweater might be wider than I’d intended by the time I hit the underarms. It might not hurt to change the rate of increase from 1 in 2 (every right-side row) to 1 in 3; Zimmerman comments that it may be appropriate to do this once the sleeves reach the point of the shoulder. The actual size of the neck opening is hard to decide, there’s a long way to go? knit? before the v closes. And the ribbing will change that anyway. 3. That I will wish I had more yarn. This is 2/3 of the first skein — I’ve got 4 more, a total of 1000yds. I’m hoping for bracelet-length sleeves, but may not make it. 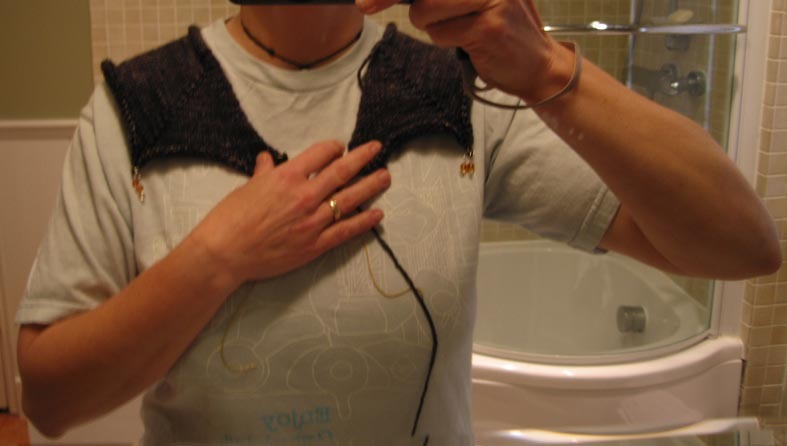 I didn’t need the mirror to tell me I love the feel of the yarn (Sundara’s Aran Silky Merino). It’s as soft as warm butter and will feel lovely next to the skin. Warm, too. Which would be nice: November has decided to play the game, and I’m being stalked by a cold. This entry was posted in Uncategorized on November 3, 2006 by sarahw. Why, oh why, do we do that hair thing? I’ve lost count of the times I’ve had a haircut I didn’t really want, just because I was bored with the style I had. Oh well, it will grow. And there are some very becoming headscarves out there (ha ha! )Your approach to the sweater dimensions sounds much more like applied logic than mine. I hope yours works out for you. I mean to try that Sundara yarn as soon as I can.Hope your cold’s better and you enjoy the weekend. I am still a bit grumpy but only a little. Feel better! I always equate winter time temperatures with longer hair. I’ve had everything from the Annie Lennox cut to really long…and somewhere about shoulder length, no longer, suits me just now. I hear you regarding the hair cuts.Keep knitting! Your sweater will be gorgeous… and feel better. This is the time of year when sniffles seem normal, unfortunately. when i do the drastic hair thing- it always means I really want to change something in my life (emotional, job etc.) but dare not.thank god hair grows!sundara’s yarn- lovely! !